Los Serranos Golf Club is one of the finest public golf facilities in Southern California, featuring two 18 hole golf courses. Located in Chino Hills, the world class facilities include championship golf, golf school and lessons, and an award winning clubhouse. Our practice areas include a large driving range, chipping greens, sand trap shots and a putting green. The South Course opened in 1964 and is one of California’s longest golf course at 7,587 yards when played from the famous Jack’s Black Tees. Framed in by a lake, the South Course finishes with the longest, signature hole at 673 yards. The course features strategic bunkers and water hazards on a rolling terrain. For over twenty years, qualifying for the California State Amateur Championship was held at the South Course as well as the Los Angeles Open, now the Genesis Open. The North Course is the shorter of the two designs, and features rolling parkland terrain with four sets of tee boxes. The 6,691-yard North Course was designed with all skill levels in mind and features Scotland style bunkers on the sixteenth hole. The back nine is especially undulating with some forced carries over ravines. Established in 1925, the North Course is one of two John Duncan championship designs that have been awarded 4 stars by Golf Digest Places to Play and is one of the oldest courses in California. Walking into the clubhouse you will experience the area’s history and love for the community. The Racquet Room restaurant & bar features a full breakfast and lunch menu and the Golf Shop is fully equipped with the most current golf merchandise. Los Serranos Golf Club provides the complete golf experience for the entire family. Driving range with 20 grass and mat tees. Golf Instruction and Golf Clinics offered by PGA Golf Professionals. Meeting & Banquet Space for groups up to 600. For water conservation, greens 100% potable; tees, fairways, and roughs blended reclaim and well water. The Raquet Room at Los Serranos Country Club is the place to dine with good friends and great food. The spacious restaurant with large window views of the golf course, easily accommodates large parties. Surrounded by historic memorabilia, the traditional bar is the ideal place to enjoy a drink and catch the latest sports on TV. Come in and have a bite after a round of golf or fuel up with a hearty breakfast before you tee off. The Raquet Room staff is waiting for you with a hot pot of coffee and a smile! 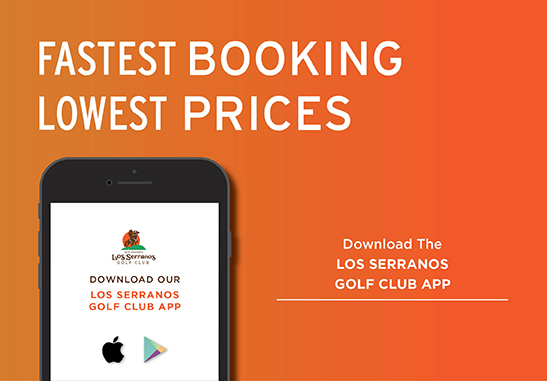 Los Serranos Golf Club is the perfect choice for hosting a golf tournament, with its signature service combined with excellent course conditions and pricing that provides one of the most competitive values in the Southern California golf market. In addition to great golf, Los Serranos offers a beautiful banquet facility and several dining options for your tournament guests. Contact our Tournament Sales Director for more information on how to host your next tournament or outing. For an overview of Adult Golf Lessons, visit Lessons & Development. For our extensive Junior Golf Program, visit our Junior Golf page. 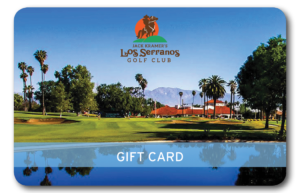 Los Serranos Men’s Club is proud to offer a Golf Club Membership which includes a United States Golf Association Index courtesy of the Southern California Golf Association (S.C.G.A.). Most tournaments start about 7 am – 8 am on Saturday or Sunday. You must have an index number before you can play in a Men’s Club Tournament. Dates and formats are subject to change. Save Every Time You Play with Deals and Discounts. 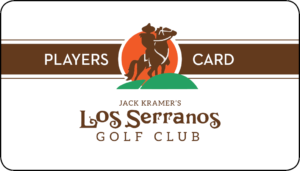 Offering Cardholders free rounds of Golf and discounted green fees, the Los Serranos Players Card program is San Bernardino’s Best Golf value. Available for purchase at the Pro Shop.